You can find more about the Brakes, Perrys, and Fletchers (my middle name is Fletcher) at the "My Heritage" page. That could also be me in the photo at the left, sitting on the log with fishing pole in hand at Lake Tahklahk near Mount Adams. Fishing is one of my passions. But another hobby I enjoy is photography, and on the day that photo was taken, I was in my canoe wjth camera rather than pole in hand. That's me in the photo at left...at my sister, Sal's place on Christmas Day, 2000. As you know from the title of my web site, I go by "Buzz," but my given name is Perry in recognition of my paternal grandmother's family, early emigrants to Massachusetts. And to the right...with my siblings, Christmas 2002. After many years of separation in areas spanning the globe, the four kids are back in Washington. Sal, lower left, and I live in University Place, Jan in Winlock, and Jack in Steilacoom, Washington's oldest town. My siblings and I grew up in the shadows of Mount Saint Helens, 20 miles down the North Fork of the Toutle River from Spirit Lake. If you know the history of Mt. 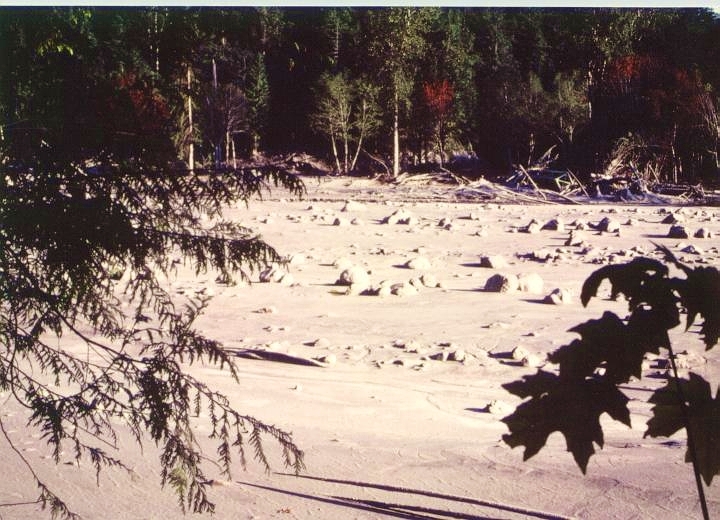 St. Helens catastrophic eruption on May 18, 1980, you will remember that a mud flow from the mountain and Spirit Lake wiped out everything along the banks of the Toutle River for many miles downstream. So it was with our childhood home. Fortunately, our parents, Jim and Gladys Brake, were forced by the government to evacuate a couple weeks before the big blow. On the morning of May 18, our Dad was getting ready to head back "up the river" for another pickup load of belongings when he actually saw the mountain erupt. We lost a lot of irreplaceable material items and a beloved home that morning. See some early photos of me here. Two weeks after the eruption, and after hiking cross country to avoid police road blocks keeping people out of the "red zone," I was the first human to walk on the land that had been our home. It looked like a lunar landscape with no sign of humans ever having been there. I have posted a photos below to give you an idea of the situation looked like before May 18th. Click here to see what Mt. St. Helens is up to right now. This photo shows our family during the August 19, 1967 celebration of Sally's wedding to Larry Neufeld and just before I departed for Vietnam. The acreage surrounding our home was thick with fir, cedar, maple, alder, and cottonwood trees. We loved having the Toutle River and its never-failing bounty of salmon, trout, and steelhead...and its sandy beach...literally at our back door. 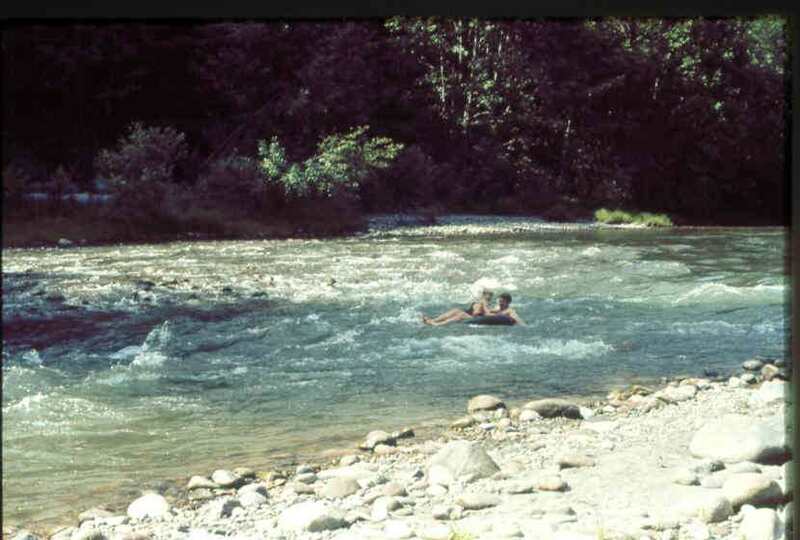 That peaceful, enchanting river was to become a monster on May 18, 1980, but before it did, we, our children, their children, and countless friends enjoyed swimming or tubing in it during the summer (photo below), and fishing in it all seasons. On May 18, 1980, things changed...drastically. A wall of mud estimated to be 40 feet high or higher came charging down the Toutle River valley, flattening everything in its path. Weyerhaeuser's Camp Baker, about six miles up river from our home, was wiped out. Ours was the closest permanently inhabited home to the mountain that was right on the river, and therefore the first family home to disappear in the mud flow. Remember the photo of the picnic above? The photo below is taken from the same place, and looking in the same direction, as the picnic photo. No sign of human habitation nor any living thing remained at our beloved "502"...only sand, ash, and boulders, reminiscent of a moonscape. In the photo to the right, taken by a neighbor from a hill above our property, you might be able to see our house floating down the river of mud. It had started its journey to the sea somewhere near the tip of the upper arrow. Several years after the house disappeared down the river, one of us found a piece of carpet a few miles downstream that was thought to have come from the house. One spring after winter floods had washed much of the sediment out of the old river bed, we found one of the andirons from our fireplace. Oddly enough, it was found just a few yards from where it would have been before the house started downstream. I would imagine the fireplace and its heavy, brick chimney would have dislodged from the house within moments while the lighter structure floated easily on the mud flow. At the right is a shot of our "swimmin' hole." They say still water runs deep, and that was true for the swimmin' hole as you can see the calm waters with a natural platform for diving on the left side of the river. What you can't see in this shot is a spacious, sandy beach on the right bank. Starting in the spring as soon as ice quit floating down the river (well...almost! ), until the first frost hit the pumpkin in the fall, the swimmin' hole was a high priority attraction for family and friends. Upstream and around a bend from the swimmin' hole was the "mouth hole," so called because it was where the "mouth" of the Green River entered the Toutle which is coming into this photo from the right. The mouth hole, shown below, was one of the best salmon and steelhead holes on the Toutle. The big ones seemed to congregate there while deciding whether to go up the Green or the Toutle. We did our best to avoid an overcrowding situation! 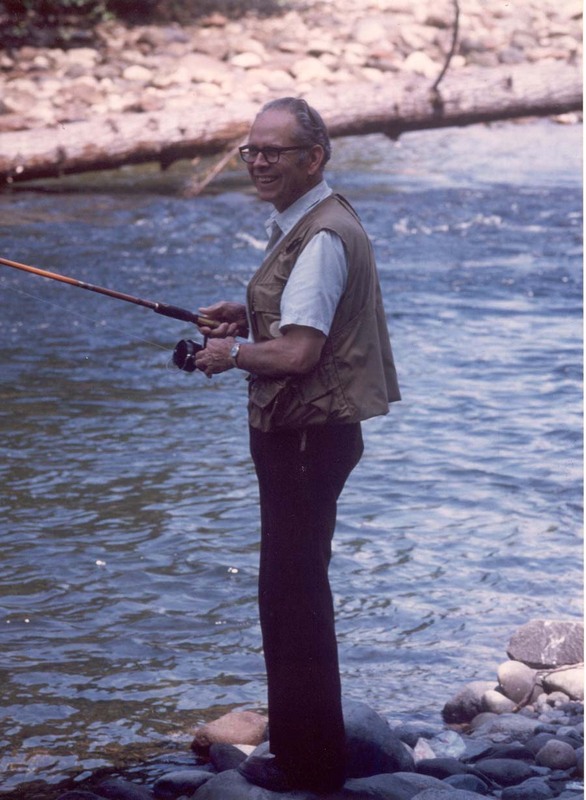 This is my Dad, Jim Brake, fishing at the mouth hole, probably for salmon because he is using his salmon/steelhead rod, and he did most of his steelhead fishing in the middle of the winter. The mouth hole was also a top producer of searun cutthroat, or harvest trout as we called them, which were the main attraction in late summer. Those we caught on flies, with the Royal Coachman Bucktail being the only one we needed. Dad peacefully joined his Lord on November 15, 2001. Please visit his page. Am I just blowing smoke? Or did we really catch fish? This photo might help convince you...and I promise that I have not used my photo enhancement software on it! These are harvest, or searun cutthoat if you prefer, trout caught in one evening at the mouth hole. I caught three, Dad caught two, and my pipsqueak (at the time) little brother, Jack, caught NINE! Dad and I didn't tell him until years later that the reason we eased off when we did was that the limit was THREE!! Warden John Lund...here's proof...jail him!! I took this photo of Mount Saint Helens in August 1999 at the 5000 foot level (hence the Indian paintbrush) about ten miles north of the mountain, directly in the path of the May 80 blast. To see and read more about the Mount Saint Helens blast and how it affected the Brake family, go to the Aftermath page (but before you do that, make sure you have read about Jan's memories of our home before the blast). By understanding where and how I grew up, I hope you will have a better appreciation of some of the other things you will see and read on my web site. Some of the other pages will take you past my childhood to my days as a Coug at Washington State University, as a Yellowjacket at Georgia Tech, as a soldier in the U.S. Army, as a chemist for the Washington State Department of Ecology, and hopefully, beyond! 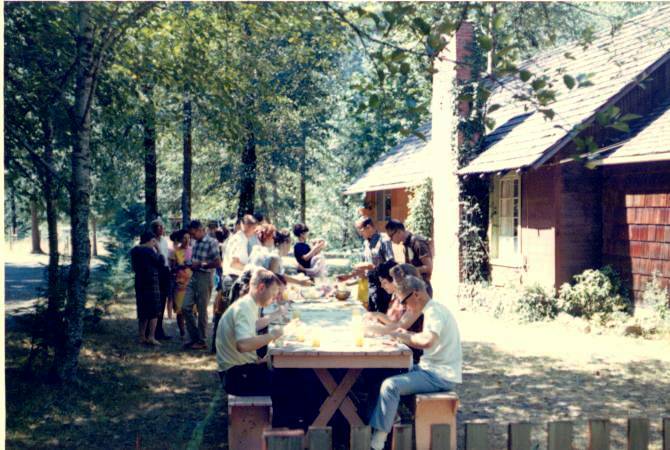 The Toutle played a very important part in our lives as we grew up on the place we called "502" because a Weyerhaeuser camp called "Camp 502" had been there until the mid-50s. Weyerhaeuser's trains picked up loggers at Camp 502 early on Monday mornings and deposited them at camps even further out in the boonies, such as Camp 9 and Camp 10 fifteen or so miles up the Green River. 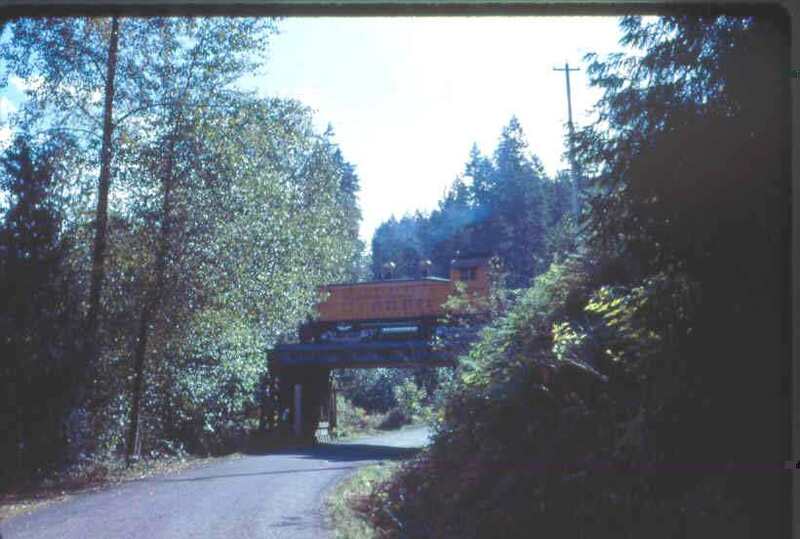 The photo on the left shows a Weyerhaeuser locomotive passing by our home in modern times, carrying logs from Camp Baker to the mill in Longview. I remember well when the "loci" was steam powered before the diesel-electrics took over the rails.